If you have a painting on the wall of your home today, it may be because of the influence of a group of painters known as the Hudson River artists. While not as individually famous as many other American painters of the 19th century, as a group they had an important contribution to make. Before the 1800's most artists were successful only if they could attract the notice of a wealthy family who could afford to have portraits painted. Artists not engaged in painting likenesses could be commissioned to recreate famous historical scenes to hang in the homes of the rich. But with the invention of the daguerreotype, a precursor to the photograph, it absorbed much of the demand for portrait painting. However, a new American school of landscape painting was about to emerge along with a new form of public entertainment — the art museum. Middle class people were about to become excited about art. Before 1830, there was no such thing as an art museum open to the public. Artists began to create work for the enjoyment of the Middle Class. Soon, it became as common to see a painting over the fireplace of a home as to find a Bible on the kitchen table. In 1839, the American Art Union was created to raise money for artists' salaries. At first, 814 members paid $5 a piece to join the union; a decade later, there were 19,000 members and $40,000 in payments to artists in a single year. One of these artists was the landscape painter, Thomas Cole. Cole had no formal training as an artist. He could not draw a likeness, or any real figure for that matter. But he understood something his peers did not. While artists had been painting Americans for over a century, no one had painted America before — the mountains, streams, vistas, valleys, the limitless frontier. So nature became the subject of his canvas as America's national myth and new identity developed. Cole became the spiritual father of the wilderness landscape artists. His early subjects were the Hudson River Valley and the Catskill Mountains, full of beautiful scenery, waterfalls, and primal mists. Thus was a bold style of "native" American art created. Other landscape painters such as Asher Brown Durand and Fitzhugh Lane, and the panoramists Frederick Edwin Church and Albert Bierstadt put on canvas not just the areas around upper New York State but also the diversity of beauty found in the far west, the Sierra Mountains, the Rockies, Latin America, and Mexico. They tried to express a love of nature and a feeling for man's place in it. At the same time, culture was becoming the province of all people not just a wealthy elite. Thus, as foreigners looked on in amazement, the Hudson River artists left European tastes behind and began to paint the magical beauty and awesome power of nature in America with extraordinary success. Search for more Hudson River School books on AMAZON. Mark D. Mitchell is Associate Curator of American Art and Manager, Center for American Art, and Judy Dion is Luce Foundation Assistant Conservator of Paintings, both at the Philadelphia Museum of Art. Written by a painter, details the development of landscape painting from blank canvas to exhibition, documenting its long struggle to become a genre unto itself while relating that development to its historic migration across an ocean. This is the largest project thus far undertaken on Frederic Edwin Church: a comprehensive scholarly catalogue of his works of art still at Olana State Historical Site, his former home in upstate New York. Divided into sixteen chronological sections, it covers 736 drawings, paintings, and prints, spanning nearly sixty years of his life. The items, each of them illustrated in the catalogue, range from doodles in his schoolboy textbooks and exercise books, to student works done under Thomas Cole, to important studio paintings exhibited during Church's lifetime, and pencil sketches and finished paintings executed in Mexico as late as two years before his death in April 1900. The holdings are most concentrated at the beginning of Church's career, between 1844 and 1850, and toward the end, between 1880 and 1898, but all phases of his travels and his art are represented, including preparations for his major studio paintings. The companion to the Cooper-Hewitt exhibition of Americas scenic wonders, as seen through the eyes of three of its greatest 19th-century artists. During the years following the Civil War, many artists, including Homer, Church, and Moran, created images of Americas scenic wonders and great landscape icons. These works, as well as decorative art objects, popular literature, photographs, and other ephemera helped to make the countrys landscape a source of national pride and promoted landscape tourism. Frederic Church, Winslow Homer, and Thomas Moran: Tourism and the American Landscape is a major exhibition mounted by the Cooper-Hewitt, National Design Museum which will showcase, for the first time in more than two decades, the museums extraordinary collection of more than 2000 paintings and drawings, which encompasses the largest grouping of Homer and Church objects in the world. Five original essays will accompany the 200 illustrations. Hudson River School paintings are among America's most admired and well-loved artworks. 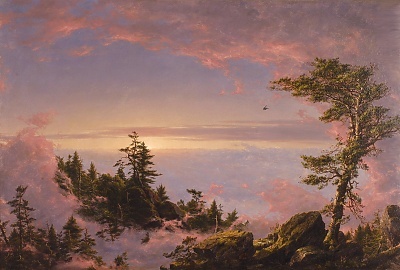 Such artists as Thomas Cole, Frederic Church, and Albert Bierstadt left a powerful legacy to American art, embodying in their epic works the reverence for nature and the national idealism that prevailed during the middle of the nineteenth century. This book features fifty-seven major Hudson River School paintings from the collection of the Wadsworth Atheneum Museum of Art, recognized as the most extensive and finest in the world. Gorgeously and amply illustrated, the book includes paintings by all the major figures of the Hudson River School. Each work is beautifully reproduced in full color and is accompanied by a concise description of its significance and historical background. The book also includes artists' biographies and a brief introduction to American nineteenth-century landscape painting and the Wadsworth Atheneum's unique role in collecting Hudson River pictures. Sanford Robinson Gifford was a leading Hudson River School artist. His love of nature first surfaced as a youth growing up in Hudson, New York, and, together with his admiration for the works of Thomas Cole, inspired him to become a landscape painter. Influenced as well by J. M. W. Turner and by trips to Europe in the 1850s, Gifford's art was termed "air painting," for he made the ambient light of each scene-color saturated and atmospherically enriched-the key to its expression. Gifford was a founder of The Metropolitan Museum of Art. At the time of his death, he was so esteemed by the New York art world that the Museum mounted an exhibition of his work-its first accorded an American artist-and published a Memorial Catalogue that for nearly a century remained the principal source on the artist. Now, to coincide with a long-overdue exhibition of Gifford's work, an important new book is being issued. This volume features essays examining Gifford's position in the Hudson River School, his Catskill and Adirondack subjects, his patrons, and his adventures as a traveler both at home and abroad. More than seventy of the artist's best-known sketches and paintings are discussed and reproduced in color. Twelve days after the onset of the American Civil War in April of 1861, Frederic Edwin Church, the most successful American landscape painter of his day, debuted his latest "Great Picture"a painting titled The North. Despite favorable reviews, the painting failed to find a buyer. Faced with this unexpected setback, Church added a broken mast to the foreground and changed the work's title to The Icebergs. He then shipped the painting to London, where it was finally sold to an English railroad magnate and subsequently disappeared from view for 116 years. This beautiful book tells the fascinating story of The Icebergs and provides a detailed look at the cycle of fame, neglect, and resuscitation of both this masterwork and Church's career. In 1979, The Icebergs sold at auction for $2.5 million, at the time the highest amount ever paid for an American painting. The sale coincided with an upswing in the popularity and acclaim accorded to American landscape painting, catalyzing the market for American art and contributing to a revival in the prestige of Church and the Hudson River School. Drawing on extensive interviews with many of the people involved with the painting's rediscovery, sale, and eventual donation to the Dallas Museum of Art, the author considers the way marketing has defined The Icebergs. This book accompanies an exhibition at the Dallas Museum of Art from September 8, 2002 until January 15, 2003. The so-called Hudson River School has a place of special importance in the history of American painting. Although there were many 'professional' artists working in the early and developing American society from the 17th to the 19th centuries, most of them, apart from the many charming naive practitioners, were itinerant portrait painters or those who looked to Europe for their style and subject matter. It was not until the early 19th century that artists began to consider the landscape which surrounded them as an interesting subject in itself; when they did, they perceived a grandeur, spaciousness and quality of natural beauty which filled them with awe and wonderment. It was this opening of the eyes of their compatriots to their natural heritage that these painters, who have come to be known as the Hudson River School, initiated. Although, in the first instance, it was the area of the Hudson River stretching northwards from New York that first entranced them, as the American continent towards the Rockies unfolded, the artists followed and produced work that revealed a magnificence of scalethe great lakes, the towering mountains. deep valleys and gorges of the land in which they found themselves. In this way, although the Hudson River was the first area to exert its influence on these landscapists and gave its name to them, their work spread widely to encompass the whole land. There was also another, transcendental, aspect to their work. they recognized the hand of God in their new environment and accordingly introduced a sense of divine mission into their painting which appealed to the adventurous religious spirit of the early settlers. Through this, their art acquired a new significance which had previously been absent. The story of the artists and their pictorial crusade is included in this selective survey which, of its nature, can only include a small number of the very many who have been identified with the Hudson River School. This volume presents through their paintings the major artists of the Hudson River School, along with many lesser-known figures. Seventy-eight full-page color illustrations of representative work are supplemented with biographical sketches and an extensive bibliography. John Driscoll's introductory essay surveys the ideas, events, and figures of the Hudson River School movement, and explores the diversity of nineteenth-century Romantic American landscape painting. The Hudson River School is really the first coherent school of American art and it helped shape the mythos of the American landscape. The artists of the School, working from 1825 to 1875, infused the American landscape with the dreams and ambitions of a young nation poised for greatness. In 1609, Henry Hudson sailed up the river that now bears his name. The exhibition and its accompanying publication Glories of the Hudson: Frederic Edwin Church's Views from Olana mark the quadricentennial of his discovery by highlighting Frederic Church's sketches of the prospect from his hilltop home overlooking the river. The excellent catalog of the exhibition organized by the Metropolitan Museum. The well-written essays, by Met curators, chart the 19th-century rise and fall of the first native school of landscape painting. The catalog includes most of the well-known and many lesser-known Hudson River pictures, discussed in depth for both specialists and generalists. The book is well-organized and well-indexed, and, while not breaking great new ground, is highly recommended. The plates are generally good. -Jack Perry Brown, Art Institute of Chicago Libs. Copyright 1988 Reed Business Information, Inc.
For over 100 years artist's have tried to master the look and feel of the Hudson River School Painters. These paintings created by Thomas Cole, Asher B. Durand and others had a special sense of air, dramatic light, distance and a luminous quality, which others have tried to copy unsuccessfully. Artist Erik Koeppel has spent over a decade studying these masters, researching their writings and notes, and discovering how they captured the feel of nature in their paintings. One time each summer Koeppel teaches a small group of painters at the Hudson River Fellowship to teach these timeless techniques. Students apply from all over the world to be selected to attend. Now you can learn these techniques from this young master. Now, for the first time Erik Koeppel shares these lost techniques. Watercolor images of Yellowstone Park painted in the early 1870s by artist Thomas Moran shifted America's gaze westward. Published as a portfolio of chromolithographs by Boston lithographer Louis Prang, these brilliant reproductions--with a companion text on Yellowstone geology by explorer Ferdinand Hayden--were the first color images of our first national park widely available to the general public. As such, they helped shape America's growing fascination with the West. The Yellowstone National Park portfolio, comprising nine images of Yellowstone and six of other sites, is also now regarded as the finest example of chromolithography ever produced. Yet today these images are less well known than Moran's dramatic oil paintings and are usually admired merely as curiosities of an obsolete technology. Joni Kinsey, a preeminent authority on Moran, shows that these and other chromolithographs by the artist in fact had an important place in American visual culture and were a vital part of the artist's career. Thomas Moran's West reproduces this renowned collection, along with two dozen other color plates and over 100 black-and-white illustrations, to recapture their impact on the American imagination. Chromolithography was outmoded by 1900 but represented an important transition in American art. Whereas previously published images of the West had been black-and-white engravings, Moran's chromolithographs had the vivid beauty of high art but could be acquired by individuals who couldn't afford originals. Today the prints are highly valued by collectors, who will appreciate seeing them with related field sketches and watercolors--and in some instances rare printer's proofs from Joslyn Art Museum. Kinsey describes the making and popularity of "chromos," chronicles the debates over their artistic legitimacy, and tells how this medium competed with other forms of picture-making in the late nineteenth century. She also explores Moran's relationship with Prang and thoroughly analyzes the Yellowstone images--including those held back from publication. Both a visual feast and an authoritative treatise, Thomas Moran's West gives us breath-taking images of unspoiled wilderness as it sheds new light on how artistic portrayals of the West contributed to our national identity. This book features 167 photographs, 50 in full color. The life of landscape painter Frederic Edwin Church (1826 1900) encompassed an expansive period in United States history, when the nations commercial, diplomatic, cultural, and scientific achievements blossomed. This lavishly illustrated bookthe only comprehensive study of the artist availabledescribes Churchs life and career and details the ways in which the artist played a part in Americas development during the nineteenth century. John K. Howat, a distinguished scholar of American landscape painting, discusses the many talents of Frederic Church while also explaining the rich complexities of his major works. One of Thomas Coles illustrious pupils at an early age, Church became a key figure associated with the Hudson River School. His adventurous international travels and the paintings that resulted from his expeditions brought him far-reaching attention, and his pictures often commanded record-breaking sums. Churchs friendships and interestsreligion, history, literature, music, architecture, agriculture, and scienceas well as his skills as a crafty entrepreneur are explored. Beautiful reproductions of Churchs extraordinary home Olana, which one can visit today in eastern New York, are also featured. For admirers of the Hudson River School, American landscape painting, and the history of nineteenth-century America, Frederic Church is an invaluable book to own. The painters who came to be known as the Hudson River SchoolThomas Cole, Asher B. Durand, Frederic Edwin Church, Jasper Cropsey, Sanford Robinson Gifford, and othersfound inspiration in our young country's natural wonders and were the first to paint many of its still-wild vistas. 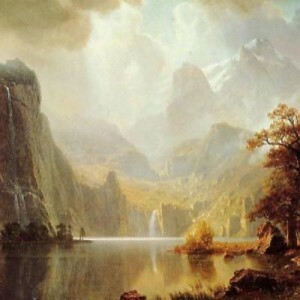 As America was settled and the wilderness receded, their successorsmost notably Albert Bierstadt and Thomas Morancarried their quest for the sublime to the Far West, communicating its breathtaking grandeur in brilliant views of Rocky Mountain peaks, roaring waterfalls, and vast canyons. Within a single generation these artists established the dramatic approach to American landscape painting that is celebrated in this stirringly beautiful book. The freshness of their vision, the intensity of their invention, and the energy of their execution were all born of the urgency these artists sensed in the life of America itself. Provides a new look at the founder of the Hudson River School of American landscape painting. During his peak popularity in the 1820s -1840s, artists flocked to New York's Catskill Mountains and Hudson Valley to confront the wilderness and emulate Cole's vision, and America's first indiginous art movement was bornthe Hudson River School of landscape painting. Thomas Cole by Earl A. Powell  Hardcover, 144 pages (October 1990) Harry N Abrams 111 illustrations, 67 in full color, 91/2 x 11"
Thomas Cole (1801-1848) is widely considered the founder of the popular Hudson River School of painting. Cole, who emigrated to the United States from England in 1819, awakened a passion for landscape that would characterize American painting throughout the 19th century and change the way Americans, and the world, viewed the young nation. In a series of breathtaking canvases, painted principally in the Catskill Mountains, Cole portrayed vast spaces, awesome horizons, and vibrant color. Earl A. Powell III, director of the National Gallery of Art, Washington, traces Cole's development and explores the Romantic theories that guided his thinking and informed his vision. Superb color reproductions bring Cole's paintings to life, revealing the America that once was. In these days of sensationalism, the images of the past often seem shadowy and rather vague. This work explores a period in American art and culture when both were infused with a strong sense of righteousness and the certainty that the artist must celebrate nature and the deity. The chapter headings--from "Seeing" to "Virtue," "Chivalry" to "Christendom"--echo the ideas expressed in the paintings, contrasting with what art critic Cooper sees as a cultural crisis in our times. Unfortunately, this work comes across as preachy and sentimental, perhaps because of the zealous morality of the time it examines. Still, the works of art, gathered from a wide variety of holdings, are an excellent record of a splendid age of landscape, and Cooper should be commended for preserving and evaluating these important records of a past era. One could only wish that the sense of moral judgment did not overwhelm the critical eye. Recommended for academic libraries and all libraries focusing on American art history. Paula Frosch, Metropolitan Museum of Art Lib., New York Copyright 2000 Reed Business Information, Inc.
Named for a fortress treasure-house in ancient Persia, Olana was the home of Frederic Edwin Church (1826-1900), one of America's most important artists, a student of Thomas Cole, and a major figure in the Hudson River School of landscape painting. Built high on a hill between 1870 and 1891, Olana holds lordly sway over sweeping vistas of the Catskill Mountains and Hudson River. Today, Olana is a New York State Historic Site visited annually by over 150,000 people, making it one of the most popular tourist destinations in the Hudson Valley and upstate New York. Called by Church "the Center of the World," Olana's Persian-style house and 250 acres of romantically-designed grounds are a personal vision of harmony between man and the American landscapea "perfect Eden of picturesque beauty, " as one 1891 visitor described it. This book tells Olana's remarkable story. Frederic Church (1826-1900), who gained international renown for paintings such as Niagara (1857), Heart of the Andes (1859), Twilight in the Wilderness (1860), and The Icebergs (1861), was inspired by his extensive travel and study. His work was also informed by his appreciation of a new visual medium. Fire & Ice, a selection from the several thousand photographs and daguerreotypes Church collected at Olana, his Orientalist home on the Hudson River, provides insight into the interests and taste of one of nineteenth- century America's greatest painters. Church was a boy of thirteen when the invention of photography was announced to the world. As a painter, he was of the first generation to grow up with photographs and consider them a useful adjunct to his work. Church collected photographs and daguerreotypes by early pioneers of the art, including Désiré Charnay, Eadweard Muybridge, and Carleton Watkins. His collection appears to have served largely as a source of inspiration and armchair travel, reminding him of favorite locations and details of architecture, culture, and landscape. In Fire & Ice, images from Church's collection are shown along with a selection of his own oil sketches, drawings, and archival materials. Some of the photographs are devoted to the varied geographical interests reflected in Church's art and travels: Central and South America, the Middle East, and the polar North. Others served as visual reference for the design and construction of Olana. Lavishly illustrated, Fire and Ice shows how the photographs in Church's collection echoed the principal stages of the painter's career. Magnificent, dramatic, sweeping, fantastic, poetic, powerful: All of these describe the paintings of Frederic Edwin Church. The National Gallery's exhibit of Church's finest works traces his career as a leading artist of the Hudson River School, America's preeminent 19th-century landscape painters.